The great thing about adding an exercise ball to your golf weight training workout is that for many of your exercises, you don't need to change that much! For example, if you were already doing seated bicep curls, just replace the bench with a ball. The same can be said for triceps, cable column flys, rows, etc. Adding the ball with utilize your core muscles to help stabilize and give you a core strengthening workout where there wasn't one before! 1. 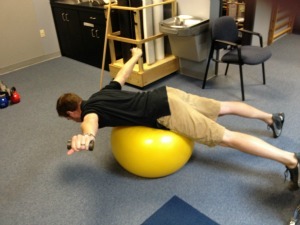 With feet on the ball - Start in the push up position but have your feet elevated on the exercise ball. 2. With hands on the ball - In this position, your feet are on the ground but you are holding on to the ball with your hands. 3. Dumbbell Fly - Not a pushup, but using the same muscles. Replace an exercise bench with a ball placed between your shoulder blades. Mid Back Strengthening - This is a three part exercise for strengthening the components of the trapezius muscle and other scapular stabilizers. 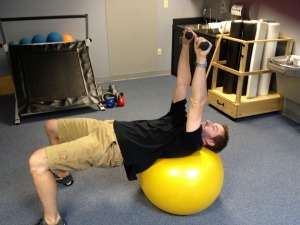 Starting position is laying on top of the ball with the main point of contact being your lower chest bone. This can be performed without weights, but if you plan on using weights, you don't need to use anything heavy! 2-5 lbs. will be more than enough for most people! I usually have patients perform 10 reps in each position but feel free to taper to your own level. 1. From the starting position, lift both arms forward like you are making a "Y" with your arms. 2. Lift arms out to the side like you are making a "T" with your arms. 3. Extend arms backwards with palms aimed towards the ceiling. Serratus Anterior Punches - This exercise is for a muscle called the serratus anterior which attaches to your shoulder blade and helps rotate the blade with shoulder elevation. This exercise can be used either with free weights or a medicine ball. 1. Start by laying on top of the ball, facing the ceiling. The ball should be placed between your shoulder blades. Your arms should be oriented directly towards the ceiling, so that your shoulders make a 90 degree angle with the rest of your body. 2. Keeping your elbows locked, and holding the weights in each hand, push your arms toward the ceiling with the motion coming strictly from the shoulder blades. Your arms will only be moving a few inches. Other great exercises that you can perform on a ball that don't need further instruction include: rows, lat pull downs, military press, bicep curls, and overhead tricep extensions just to name a few.